Chinese-style eggrolls tend to be short and fat and made from square dough wrappers. 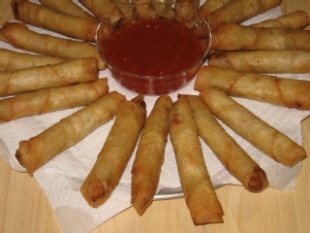 Filipino-style eggrolls are generally longer and slender and made from round lumpia wrappers. Gloria was kind enough to share her delicious eggrolls with us one balmy Alaska evening during our summer farewell get-together. Shred onion, celery, green Bell pepper and carrots. When cooking is complete, set pan aside and allow the mixture to cool to a safe handling temperature. Heat oil to 375°. 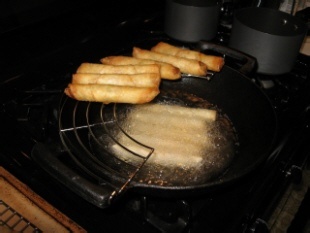 Fry eggrolls in small batches to minimize a drop in the frying oil temperature. Cook for 2 to 3 minutes or until eggroll is golden brown. Use tongs to turn over and cook and additional 1 to 2 minutes. If you have a rack for the wok, drain the eggrolls over the hot oil while adding the next batch of eggrolls. Then transfer the eggrolls to a wire rack to cool to a finger safe temperature. Serve eggrolls with a sweet chili sauce dip.